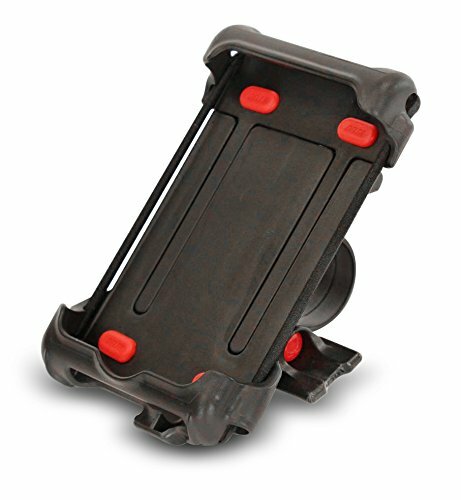 The Delta Smartphone Caddy is a very versatile and flexible product that provides a craddle for your phones, keeping it handy to operate and close enough so you know when a call is coming in. It is designed to allow you easily access on screen displays while you are biking and it fits perfectly. Now there’s no need to stow away your phone from your sight while you are on the go. It comes with a platform that is wide enough to accommodate phones with bigger sizes and includes a water resistant bag that is also friendly with diverse weather conditions. Securely locks your device in place to prevent shakes. Made from a high quality plastic material that can withstand tears and wears and comes with grips made from rubber to tightly secure your device as well as dampen any vibration. Compatible with different models of blackberry, iPhone, and many android devices with screen size up to five inches. Comes with mounts for bike frame and handlebars and to offer a customized fit, felt bumpers are utilized. Delta Smartphone Caddy is a very useful accessory and comes handy if you want to operate some functionality on your phone while on the go. The stem mount comes redesigned by the manufacturer and they are now being made from nylon to offer a better attachment void of breaking that the previous ones always encountered. This product is easy to use and you can manipulate your device while your eyes are still tuned on the road thereby not compromising your safety. The Delta Smartphone Caddy is a good holder for your phones and is worth buying.